What goes good with morning coffee? Lessee, we've done scones, bagels, mini-muffins, and crumpets. It's time to pull out an old recipe for healthy-type muffins. I haven't made these in a loooong time, I forgot how good they are. Combine all dry ingredients in large bowl. Add milk, butter, yogurt, vanilla and beaten egg. Mix until creamy. 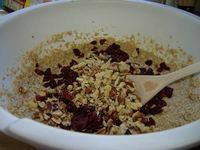 Stir in cranberries and nuts. See below for variations suggestions. Spoon into muffin tin, filling cups just to top. Bake at 400F for 15-20 minutes. I've made these with dates, raisins and mashed bananas instead of cranberries. If you use bananas (especially if they're quite mushy) you might want to cut back a bit on the yogurt. The yogurt is what makes these muffins really moist, but mushy bananas will do the same thing, and you don't want to overkill. Another tasty variation is blueberries and blueberry yogurt. That's a really yummy combo. If you want less fat, use 1% or 2% milk and low-fat yogurt. The recipe makes 24 small muffins (don't fill the cups completely full), but I prefer mondo-ginormous muffins with my morning coffee. So I use the big-size muffin tins, and fill them more than full. This requires a slightly longer cooking time. The result is ... well ... ginormous. And delicious. Great for brunches, and afternoon tea parties too. Although if I were going to serve these at a tea party, I'd probably make them smaller. Great recipe! Love the yogurt. I substituted 1/2 cup of flax for 1/2 cup of whole wheat flour ... a great option to boost your omega 3s if you happen to have any lying around. Hello, I was looking for a bran cranberry muffin recipe for my daughter who works two jobs and deserves a great muffin, she loves cranberries. 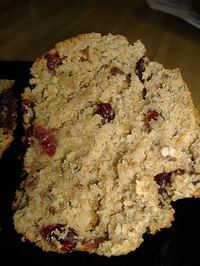 I printed this recipe, sounds DELICIOUS... Can I use frozen cranberries?? thank you so much for this great recipe. I happened upon your site quite by accident, but this recipe is amazing! I tried it this morning, and it was really hard not to eat them all right away. Yum yum yum! 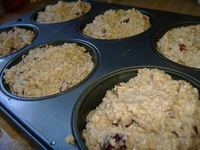 Your bran muffin recipes are exactly what I was looking for to make good bran muffins. 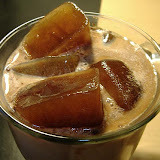 My recipe (on my blog) turned out very heavy. Can you use frozen cranberries for these? 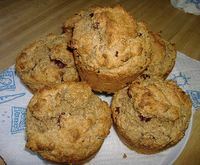 I made these muffins, and they are as good as they sound.I did use chopped dates and a few raisens instead of cranberries. These muffins sound delicious, I am going to bake a batch. I am trying to get Mr.Completely to eat a little more "healthy" foods.